Random thoughts, hidden emotions rising to the surface, daring admissions of guilt or pleasure.....that's what you'll get from The Honeycutters. 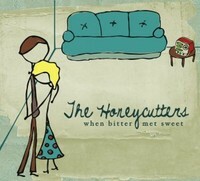 Their new album, When Bitter Met Sweet, is not a therapy session, but rather a joyful release, presented in a folk/honky tonk mix. Acoustic guitar and mandolin combine with pedal steel and drums to provide a pleasing backdrop for singer Amanda Anne Platt's original songs. Co-leading the band is guitarist Peter James, who is full of a wonderful nervous energy, and you can tell he is listening carefully to Amanda's words before he creates his musical fills. They are based out of Asheville, North Carolina, and are beginning to tour throughout the country. Matt Smith plays the pedal steel, and Tal Taylor the mandolin. When Bitter Met Sweet recalls old emotions and will easily pull yours out of the closet too. If you have ever written a "Dear John" letter, then you'll understand "90 Miles (The Tennessee Song)" which details specific reasons for leaving. Usually these feelings are felt but never shared, but songs can be the perfect vehicle. There are happy songs too. "Getting Good at Waiting" is a misleading title, as it is an expression of gratitude for a place on earth. One day we all hope to have that cabin in the woods, and once it's there and you're there, you might feel just as satisfied, with no desires for more. "For Eleanora" is a perhaps the album's best song - it's certainly catchy, and it tells a good story too. Eleanora is a New York singer falling from grace. Fame usually brings success, but too often temptations come along for the ride. It's not clear if this singer is real or imagined, but many singers from history easily come to mind. "All I Got" is about a couple making an effort to compromise. The wonderful side effect of the conversation is that admissions of love come pouring out, trumping the reasons for the discussion in the first place. Hopefully you're enticed enough to listen for yourself.